SULO NZ operates under a Quality Management System and is committed to complying with all requirements of ISO 9001. 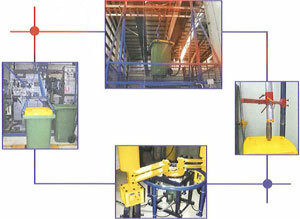 The scope of the quality system includes the design, development, manufacture, sales, distribution and recycling of mobile garbage bins and waste handling products. The system allows SULO NZ to control all processes; ensuring customer requirements and product performance standards are consistently met. We ensure that our MGBs are safe, user friendly and built to last, which is why our bins comes with a stamp of approval in the form of either a DIN EN 840 certificate or an RAL quality mark. Waste containers that carry the RAL quality mark are guaranteed to provide maximum usability, working safety, environmental protection and compliance with applicable standards, including DIN EN 840. DIN EN 840 is the European standard for the manufacture of mobile waste containers that specifies requirements for the dimensions and design, the performance criteria and testing, and the health and safety requirements of an MGB. SULO two wheeled containers are manufactured in accordance with DIN EN 840. To obtain this certification, SULO MGB Australia was required to send MGB’s made in the Australian manufacturing plant to an authorised testing facility in Europe, where the bins were put through a series of tests. SULO MGB Australia emerged as the only Australian manufacturer of MGB’s carrying the DIN EN 840 certification. Having set a quality benchmark in Australian waste management, SULO MGB Australia then approached Standards Australia to establish a national standard for the manufacture and use of MGBs in Australia. From this approach AS4123 was created, providing the Australian waste and recycling industry with a clear standard that calls for independent third party product certification to guarantee product quality.